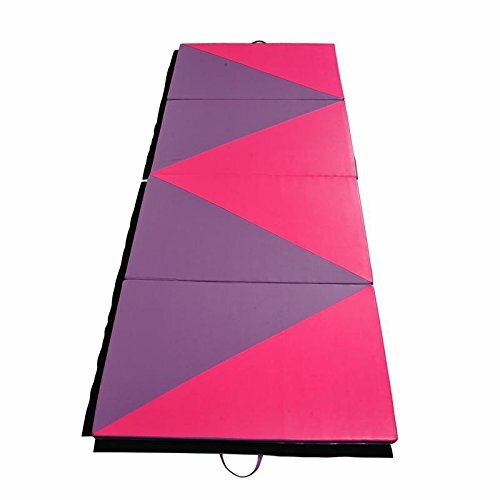 Our brand 4' x 10' x 2" folding gymnastics mat is a great addition to your home gym and provides you with a comfortable spot to do your floor exercises. This exercise mat is thick and quite durable. It has a convenient design so that you can fold it and store it when not in use. The gymnastics mat also has sewn in handles making it portable and convenient, so you will no longer have trouble transporting the mat to and from gymnastics or sporting. Our exercise mat is covered with PU leather which is non-absorbent and will enable you to clean it easily. With its ease of use, durability and its non-absorbent technology, this exercise mat is ideal for a great workout. Material: 2" thick firm white high density EPE foam, PU leather - Dimensions: 4'W x 10'L x 2" thick pad - Panel Number: 4 Panels - Panel dimension: 4' x 2.5' x 2"
View More In Mats & Flooring. New Brand 1 PCS PU Leather Cover Gymnastics Mat Thick Folding Panel Gym Fitness Exercise Color Pink & Black Size 4'x10'x2"